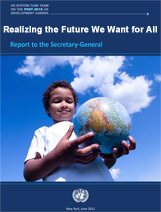 In its report Realizing the Future We Want for All, the UN System Task Team on the Post-2015 UN Development Agenda lays out its main findings and recommendations for a development agenda beyond 2015. It calls for an integrated policy approach to ensure inclusive economic development, social progress and environmental sustainability and a development agenda that responds to the aspirations of all people for a world free of want and fear. The report will serve as a reference for further broader and inclusive consultations on the post-2015 development agenda. The present report outlines a bold vision for transformative change towards inclusive, people-centered, and sustainable development and considers some parameters for consideration when shaping the global development agenda. It arrives at these recommendations by thoroughly discussing the strengths and weaknesses of the Millennium Development Goals and by assessing a number of pressing development challenges that need to be addressed in a global agenda for sustainable development. Finally, the report offers a number of suggestions on the way forward for the consultations of the post-2015 agenda. For further information on the UN System Task Team on the Post-2015 UN Development Agenda, please visit http://www.un.org/millenniumgoals/beyond2015.shtml or contact Diana Alarcon, UN-DESA, or Selim Jahan, UNDP .